Here is a shortcut on how to do a fast sketch of rose. I always look for the quickest and easiest way to draw anything so if that's you too, stick with me and we'll find it, for sure. You can adapt these steps to suit how you perceive a rose. The rose sketch that you see here is the final illustration in ink. It's also larger than I would normally portray it. If you have any trouble following the steps below, please come back to this image for reference purposes because it's a bit clearer than the examples in pencil. The first thing to establish is that we are discussing sketching, not drawing. 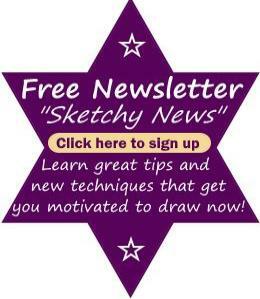 A sketch is to be performed in the shortest amount of time possible. You only need to capture enough information to give a good representation of your subject so that it's instantly recognizable. The main thing you need to remember while you are drawing roses is the fact that most roses have five petals. This little bit of information will help you depict a good sketch of rose plus it simplifies the process. Are you ready? Let's Start Sketching! 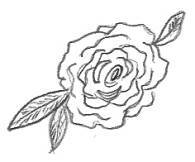 You can draw the intricate center of the rose by doing a figure similar to the @ symbol. I would actually change the "a" to resemble more of a teardrop. Draw a couple of crescent moon shapes around this symbol. Now you need to draw some curvy lines around the moon shapes. You can do anywhere between 3 to 5 of these lines in one layer. It depends on how much space you have and how big your sketch is -- I wouldn't do it too large. Place these curvy lines across the gaps left between the moon shapes. Lastly, draw 5 petal shapes in 2 or 3 layers around the centerpiece. Start the first petal across a space between the curvy lines. My images have been enlarged for your viewing and therefore the quality is not so good, sorry. However, if you have followed the directions to the best of your ability, you should end up with something very similar to this. Each one of mine is different so if you just keep practicing, you are bound to turn out quite a few really good ones. Step back from your drawing and view your sketchy rose. What do you think? You are drawing this rose from the perspective of looking into the face of the rose. Once you are happy with the results, you can add some leaves. You usually won't see the stem from this view point but it's your sketch, you can add it in if it looks right. When you are finished, if you think the rose looks too bare, sparingly place a couple more short strokes in there to represent the cluster of petals. You can fiddle until you're satisfied that you've accomplished a good rose sketch. Keep your kneadable eraser handy to erase any lines you add by mistake. Try not to obsess over your artwork, just do another until you strike the happy medium. By using this method, it only takes a minute to sketch a rose. If you wanted to, do your lines lightly at first and then once you're confident with the sketch of rose, go over it to darken the good lines. Use your light lines as your guidelines and erase the ones you don't need. I think this is so easy, even someone with no interest in art would be able to get a good resemblance of the rose. I tried this experiment on my husband who doesn't draw but he was quite proud of his achievement! Good luck and I hope you do very well. Mainly, I just want you to enjoy the experience!